Had to check out this pair of Buick Centurys that arrived at the U Pull this past week. 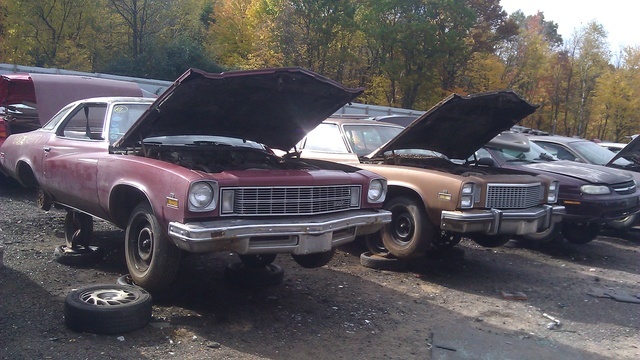 Maroon one is a '75 "Special" and gold one is a 4-dr '76. Both were sporting the V6/Auto drivetrain...and, virtually no options outside of pwr strg/pwr brakes & A/C! Haven't seen any of our era cars at this yard in at least 3 yrs. Interesting info on the '75...there was a pocket note pad in the glove box where the owner kept meticulous records of each gas purchase/odometer reading beginning in 1981. Last entry was in '87 with a note that the car has been "parked" with 42K miles on it...and, that's what is currently showing on the odometer. Would be interesting to know why? Thats neat. Thats the first year of the 231 3.8 buick v-6. Being that they are side by side I wonder if they came from the same person. Our local u pull yards only separates by brand and never model. They just clear out a roll and put the new arrivals together. If we are lucky we might get 1 G3 per year. Shame to see a car with such low miles end up in a junk yard. What condition is it in, overall? That's a fact! Road salt ate these cars alive back then in relatively short order. Rear bumper had rust-thru (typical of our cars as the frozen slush got kicked up and packed in the nooks and crannys only to eat away at the metal all winter long). From what I recall, the body panels weren't in bad shape. Underside was a little crusty...but, I've seen worse. I live in NY I know about rust/rot. I dont think that is what got that car. Bottom of doors/fenders are still there. I live in Denmark, Europe. it's pretty humid and damp here... all the time. PLus they salt in the winter. It's a terrible place to own a car. I think I see something on at the bottom of the quarter panel, where it meets the door. Also looks like something's going on at the bottom of the front fender. Qtr window moldings were typical junk. I did pull most of the interior headliner. sail panel and kick panel trims. Also, nice sunvisors and lower door panels. Color is Dark Saddle if anyone is interested. Was "75 quarter window trim plastic.? Yup...'74 and up were plastic.